We are pleased to announce that we will be hosting an open day at the tennis club on Saturday 30th March 2:00 – 5:00pm. The open day offers the perfect opportunity to meet our members, talk to our coaches and join in with our taster tennis sessions. Join us for a few hours to kick off the 2019 season! You love playing tennis? You’re aged between 12 and 18? Why not join Roe Green Tennis Club and get a chance to play competitively in the Bolton Junior League? Bolton League have changed rules for the 2019 season, so teams now only require 4 players (previously 8) – ideally two boys and two girls – to participate. As we did not field teams in the past 2 seasons, we are looking to start from scratch in the lowest division. 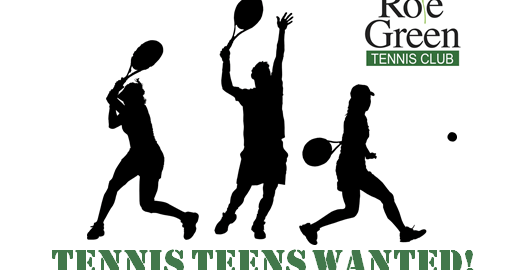 We are looking for boys and girls aged 12-18, who are enthusiastic about tennis and able to rally confidently. Younger players may be considered, if their ability is suitable. And if you know of someone else that might be interested, please share or forward this info to them and their parents. We would love to hear from you and discuss the club and the competition in more detail!